The 118th Brawl of the Wild is the subject of this week’s UM News. It’s all about rivalry!! 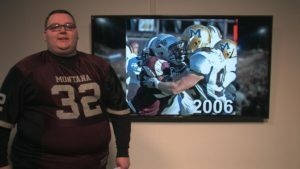 This week we’ll take a look at the economic impact of hosting the game, die hard Griz fans gearing up for battle and how students help keep the team ready to play. This show was produced by Andrea Dobbins and directed by Justin Jackson. Go Griz!